Pullouts along Lutak Road offer views of Haines and overlooks for wildlife viewing. Look for river otters, Steller sea lions, harbor porpoises and harbor seals in the waters of Lutak and Chilkoot Inlet. A few humpback and killer whales swim into the inlet as well, especially in May and June. Look and listen for belted kingfishers, common loons, harlequin ducks, surf scoters, pigeon guillemots, boreal owls, bald eagles and other birds along Lutak Road. 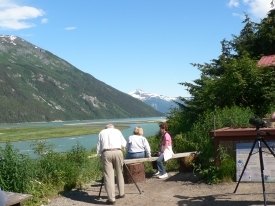 The estuary where Chilkoot Inlet meets the Chilkoot River is a rich birding spot. Lutak Inlet is narrower and more sheltered than Lynn Canal, making it an easier area to spot marine mammals and birds. Naturalist-guided tours are available to Lutak Road, some of which combine it with trips to the Chilkoot River and Lake. Check with the Visitor's Bureau for details. Use the pullouts along Lutak Road as bases from which to scan for wildlife. Do not stop in the middle of the road if you spot wildlife, as it can be dangerous for you and other drivers. Lutak Road parallels the protected waters of Lutak Inlet, just north of downtown.